Wanted for criminal possession of a controlled substance 7th degree, vehicle and traffic tickets. 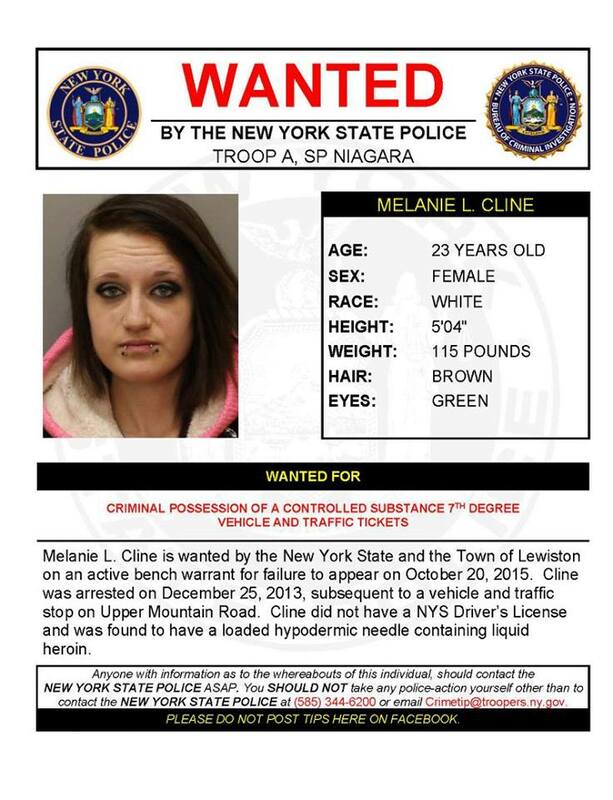 Melanie L. Cline is wanted by the New York State and the Town of Lewiston on an active bench warrant for failure to appear on October 20, 2015. Cline was arrested on December 25, 2013, subsequent to a vehicle and traffic stop on Upper Mountain Road. Cline did not have a NYS Driver’s License and was found to have a loaded hypodermic needle containing liquid heroin. Anyone with information as to the whereabouts of this individual should contact the NEW YORK STATE POLICE ASAP. You SHOULD NOT take any police-action yourself other than to contact the NEW YORK STATE POLICE at (585) 344-6200 or email Crimetip@troopers.ny.gov. Please do not post tips here on Facebook. 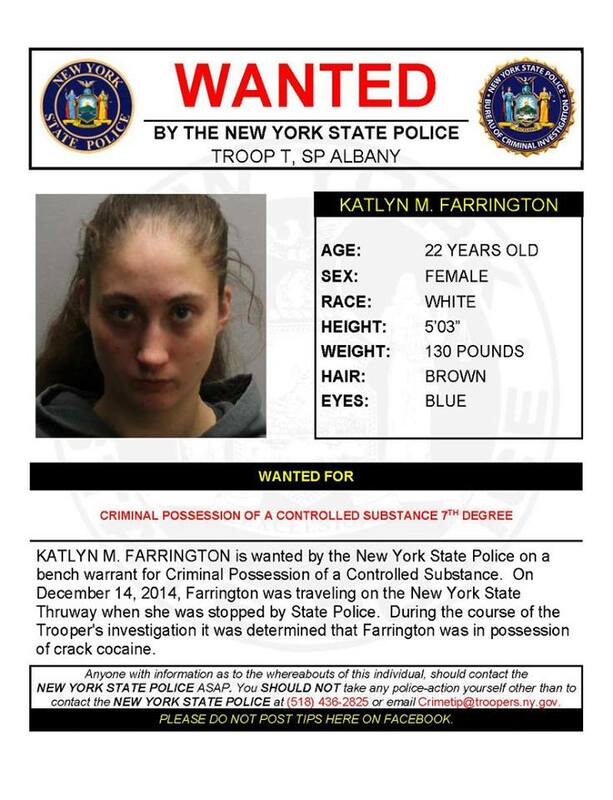 KATLYN M. FARRINGTON is wanted by the New York State Police on a bench warrant for Criminal Possession of a Controlled Substance. On December 14, 2014, Farrington was traveling on the New York State Thruway when she was stopped by State Police. During the course of the Trooper’s investigation it was determined that Farrington was in possession of crack cocaine. Anyone with information as to the whereabouts of this individual should contact the NEW YORK STATE POLICE ASAP. You SHOULD NOT take any police-action yourself other than to contact the NEW YORK STATE POLICE at (518) 436-2825 or email Crimetip@troopers.ny.gov. 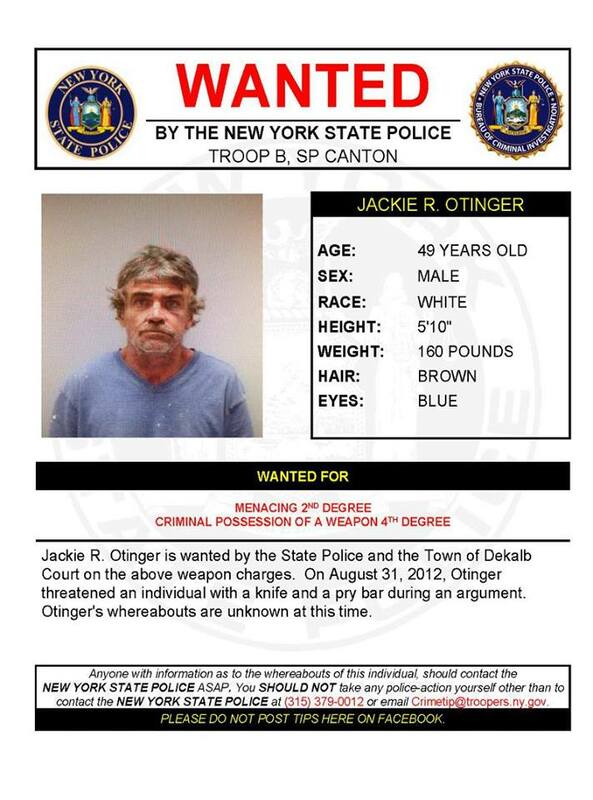 Jackie R. Otinger is wanted by the State Police and the Town of Dekalb Court on the above weapon charges. On August 31, 2012, Otinger threatened an individual with a knife and a pry bar during an argument. Otinger’s whereabouts are unknown at this time. 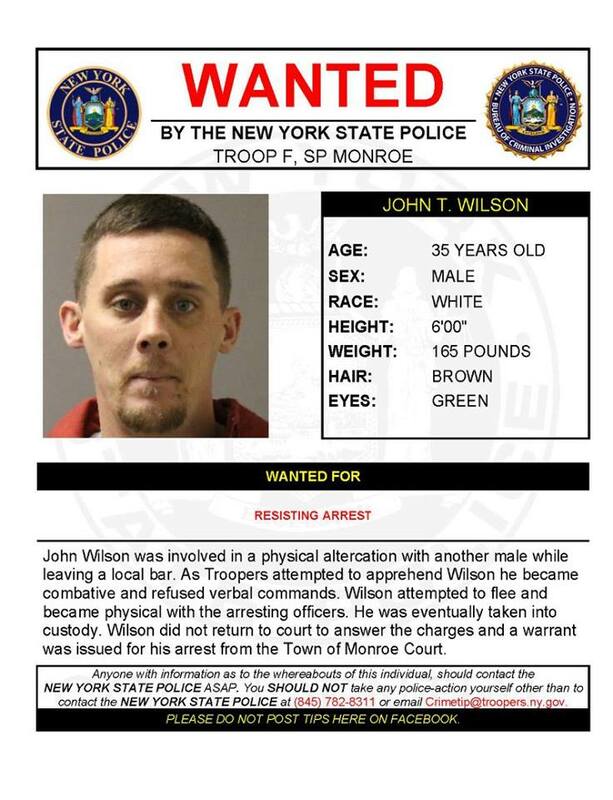 Anyone with information as to the whereabouts of this individual should contact the NEW YORK STATE POLICE ASAP. You SHOULD NOT take any police-action yourself other than to contact the NEW YORK STATE POLICE at (315) 379-0012 or email Crimetip@troopers.ny.gov. 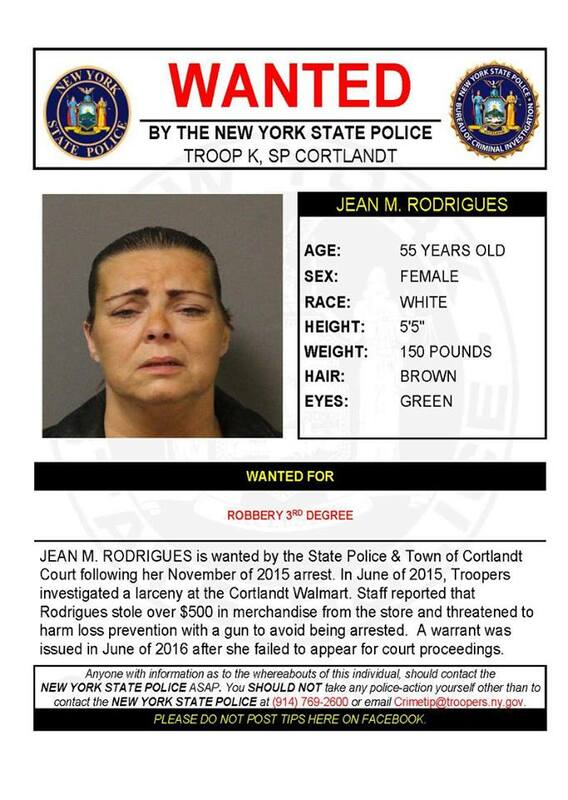 JEAN M. RODRIGUES is wanted by the State Police & Town of Cortlandt Court following her November of 2015 arrest. In June of 2015, Troopers investigated a larceny at the Cortlandt Walmart. Staff reported that Rodrigues stole over $500 in merchandise from the store and threatened to harm loss prevention with a gun to avoid being arrested. A warrant was issued in June of 2016 after she failed to appear for court proceedings. Anyone with information as to the whereabouts of this individual should contact the NEW YORK STATE POLICE ASAP. You SHOULD NOT take any police-action yourself other than to contact the NEW YORK STATE POLICE at (914) 769-2600 or email Crimetip@troopers.ny.gov. John Wilson was involved in a physical altercation with another male while leaving a local bar. As Troopers attempted to apprehend Wilson he became combative and refused verbal commands. Wilson attempted to flee and became physical with the arresting officers. He was eventually taken into custody. Wilson did not return to court to answer the charges and a warrant was issued for his arrest from the Town of Monroe Court. Anyone with information as to the whereabouts of this individual should contact the NEW YORK STATE POLICE ASAP. You SHOULD NOT take any police-action yourself other than to contact the NEW YORK STATE POLICE at (845) 782-8311 or email Crimetip@troopers.ny.gov. 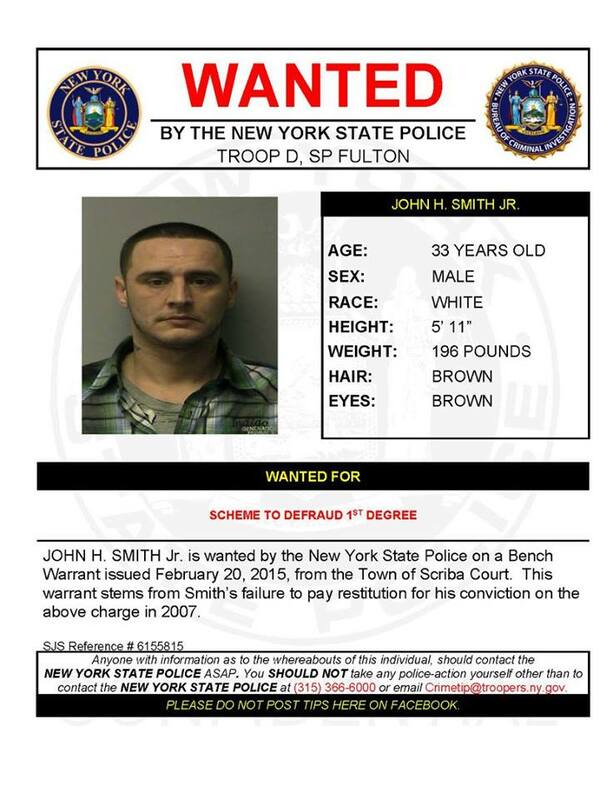 JOHN H. SMITH Jr. is wanted by the New York State Police on a Bench Warrant issued February 20, 2015, from the Town of Scriba Court. This warrant stems from Smith’s failure to pay restitution for his conviction on the above charge in 2007. Anyone with information as to the whereabouts of this individual should contact the NEW YORK STATE POLICE ASAP. You SHOULD NOT take any police-action yourself other than to contact the NEW YORK STATE POLICE at (315) 366-6000 or email Crimetip@troopers.ny.gov. 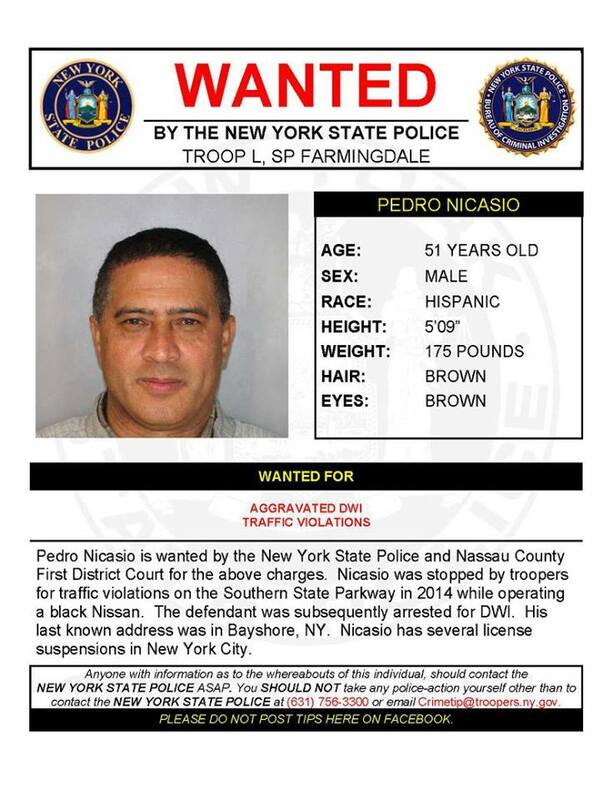 Pedro Nicasio is wanted by the New York State Police and Nassau County First District Court for the above charges. Nicasio was stopped by troopers for traffic violations on the Southern State Parkway in 2014 while operating a black Nissan. The defendant was subsequently arrested for DWI. His last known address was in Bayshore, NY. Nicasio has several license suspensions in New York City. Anyone with information as to the whereabouts of this individual should contact the NEW YORK STATE POLICE ASAP. You SHOULD NOT take any police-action yourself other than to contact the NEW YORK STATE POLICE at (631) 756-3300 or email Crimetip@troopers.ny.gov. 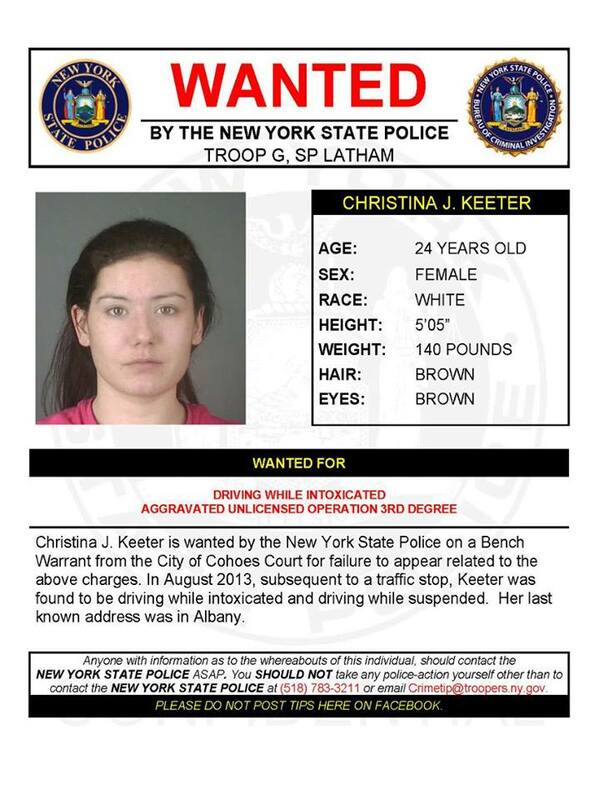 Christina J. Keeter is wanted by the New York State Police on a Bench Warrant from the City of Cohoes Court for failure to appear related to the above charges. In August 2013, subsequent to a traffic stop, Keeter was found to be driving while intoxicated and driving while suspended. Her last known address was in Albany. Anyone with information as to the whereabouts of this individual should contact the NEW YORK STATE POLICE ASAP. You SHOULD NOT take any police-action yourself other than to contact the NEW YORK STATE POLICE at (518) 783-3211 or email Crimetip@troopers.ny.gov.